"My mule don't like people laughin'..... "
Si "La Mule" coche toutes les cases de l'acteur-réalisateur américain, c'est aussi un faux petit polar, et un vrai grand film. If The Mule ticks all the boxes of the American actor-director, it's also a false "little cop movie," and a truly great film. Eastwood revient devant la caméra pour un film très personnel où il n’est plus question de la légende, mais juste de l’homme. Clint is back. Eastwood is back in front of the camera for a very personal film where it is no longer about the legend, just the man. Clint is back. Le Monde's recommendation: Don't miss it. I'm just giving the headlines, but anyone who has enough French should check these out. There's also an interview in Le monde, but it's for subscribers only. I only came across this by accident. It may have already been posted since I wasn't looking at this thread for about 6 weeks. It's from an Australian Morning TV show from December 12 last year, so at the end the reporter is talking about the possibility of the film being nominated for awards. "Picasso said 'it takes time, a long time to become really young' and this paradox seems to be the figure of the film The Mule..." R.L. Thanks, and welcome to the Board! 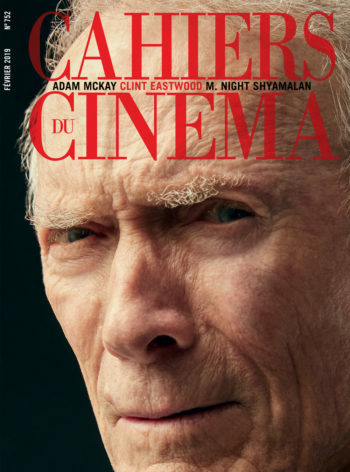 Clint did the cover of French magazine Les Cahiers du Cinéma in the issue of February 2019. This is the first time since the issue of January 2012 for J. Edgar. Some good articles are written about The Mule. The review is very positive. "Les scènes de danse et les scènes de chant (avec la voiture transformée en juke-box amoureux enchaînant vieux classiques et tubes de crooner) rythment le film, et cette idée de la danse et du chant comme scansions d'un corps libéré de son poids et de sa hantise de la mort trouve son acmé lors de 2 séquences inouïes : celle effarante de légèreté et de liberté qui voit le vieillard se laisser entraîner par deux prostituées dans une nuit d'ivresse, et celle qui transforme un peu plus tard, lors d'une cérémonie de mise à mort digne des plus grands mélodrames de l'auteur, la plainte de sa femme malade en une sorte de chant d'oiseau terrassant d'émotion. Le lyrisme de l'œuvre du cinéaste a toujours tenu dans cet écart entre légèreté et tragédie, petits films et grands films, fragilité du vivant et dureté du mythe et de la mémoire. "La Mule" redéploie l'enjeu métaphysique du lyrisme eastwoodien dans les limites de ce corps dont on ne sait, d'une séquence à l'autre de ce film qui tient moins de la boucle bouclée que de la parenthèse enchantée, s'il jouit de sa fin ou de sa renaissance, de sa précarité assumée ou de sa jeunesse retrouvée un peu comme s'il se tenait posté sur la frontière invisible départageant sa terrible fragilité et sa prodigieuse vitalité mythologique." "The dance scenes and the singing scenes (with the car turned into a love jukebox linking old classics and crooner's hits) punctuate the film, and this idea of ​​dancing and singing as scansions of a body freed from its weight and its obsession with death finds its acme in two unprecedented sequences: the frightening lightness and freedom that sees the old man let himself be dragged by two prostitutes in a night of drunkenness, and the one who transforms a little later, during a killing ceremony worthy of the greatest melodramas of the author, the complaint of his sick wife in a sort of bird song overwhelming with emotion.The lyricism of the work of the filmmaker has always held in this gap between lightness and tragedy, small films and great films, fragility of the living and harshness of myth and memory. "The Mule" deploys the metaphysical issue of Eastwood lyricism within the limits of this body of which we do not know. from a sequence to another of this film, which is less about the loop than an enchanted parenthesis, whether it enjoys its end or its rebirth, its assumed precariousness or its youth refound a little as if it were standing on the invisible frontier separating its terrible fragility and its prodigious mythological vitality. " Cette mort chez Eastwood est une première. Lui qui s’est filmé mourir tant de fois, regardé souffrir et disparaître. Cette fois, c’est lui l’homme allongé de côté sur le lit, avec cet air un peu incrédule un peu remonté qu’on lui connaît : c’est l’autre qui meurt, et cet air sceptique rend alors un autre son - l’étonnement que ce ne soit pas lui. This death [of Earl's ex-wife] is a first for an Eastwood film. He has filmed himself dying so many times, observed himself suffering and perishing, but this time, he is the man stretched out on his side on the bed, with his familiar slightly incredulous, slightly annoyed expression: it's the other one who is dying, and his skeptical expression has another overtone: astonishment that it's not him. If I'm not mistaken, Eastwood only "films himself dying" in two films: Honkytonk Man and Grand Torino. A good review, anyway. raising many points that I've not really read anywhere else... I'd be interested to see what you all think..
Have you noticed that The Mule is already the most talked topic here? The overwhelming majority of the cartel guys Earl interacts with are legitimately friendly, and usually just hanging out enjoying themselves – a far cry from the snarling south-of-the-border psychos destroying America in films such as Sicario (2015). Where does this come from? The only cartel guy that was "friendly" to Earl was Laton, and that was just because he was making him obscene amounts of money and was so old that he was largely not on most of the cops radar for most of the film. It seems like he was watching a different movie than I was! I got the feeling they were mostly friendly, in a swaggering sort of way. And why not? Earl is making them money. I've only seen it once, though, so maybe I'm misremembering. There are a lot of them here, but I chose only those two reviews on The Mule. I translated just part of the first one for thinking it most significant. The Mule works lika a mix of everything that was school to the director passing through all the elements found in many of his works e mixing all personality characteristics of his roles through of his career (joker, tough, smart, fair-minded, womanizer, emotional). Exactly because of that, The Mule is the perfect goodbye (which we hope isn't true) of this true legend. This other one below is very bad and unfair, I think. The inevitable fail is announced as soon as the script, based in true story try of Leo Sharp, try to create a parallel between James Stewart and Eastwood persona. Just for knowing a little about the career of the star of Vertigo to see the impossibility of the project: the first is the archetype of the good man that fights to reverse the crisis he went through and comes up like a bittersweet hero at the end; the other is the Man with no Name, a cold-blooded gunslinger. Therefore, much as all secondary characteres that Earl meet on his way as a transporter of cocaine make efforts to convince us of the similarities between the essences of those two stars, this a task doomed to fail. Because we got very little to believe in the goodness of the protagonist of The Mule. Because after all, the florist is someone that made a big mistake, that ran to the drugs traffic to try to recover his home and that way, contributed to the industry of narcotraffic. All the subplot that involve the characteres is totally irrelevant and doens't help that narrative bow of the character. Among the police persecutions and personal dramas, the plot of the movie gets over filled. Eastwood that was never a subtle movie maker, lost himself completely trying to creat a transition between a road movie, a crime suspense, a family drama and a displaced comedy. For not picking only one of the narrattives, for not accepting the thriller nature of the project, underestimating solid and catchy performances of the agents played by Bradley Cooper and Michael Pena, he shows that his Gran Torino days are definitely in the past. This mismatch only add to the deception caused by this hybrid, that rips laughs is wrong moments_ the scenes in which Earl interrupts his way to give car advices to a black family and to a group of lesbian motorcyclists are embarrassing and despite the good intentions of both sequences in treat the character like a tolerant old citizen. About the technical aspects, Eastwood didn't loose the rhythm and the capacity of direct a movie. Despite all, The Mule doens't make any mistakes in this area.The edition and photography give the correct visual and pace to the picture and all the supporting cast filled with names like Andy Garcia and Laurence Fishburne make the possible to save the endeavor. And this is the point. If werent the ethical issues of the picture— Eastwood doesn't seem to understand that Earl is a criminal, independent of his motivations, in trying to turn him into a hero—the project wouldn't need to be rescued from itself. But all The Mule want is makes us sympathize with a villain without never see him with a minimum of critical sense. Any self respected antagonist must seduce in a certain way, the audience. In Earl case, this ambiguity is never built: the script tell us that we just must have consideration and empathy for the protagonist just for the fact he is a old man victim of the circumstances_something that he clearly is not. By the way, Eastwood, this model of vegenful cowboy, would need to effort much more as an actor to convince us that he is merely helpless. With an inexplicable obsession for cell phones and way too much didactic dialogues ,The Mule sounds like an attempt of his star of redeem himself of Blondie's crimes. It's like if Eastwood was trying to prove that his reviewers are wrong and his ideas have changed. However the world vision of the filmmaker seems to keep intact even if mascared like the insane party in Mexico shows: everything remains the same, after all. He can recognize he made mitakes but he can't be more than a draft of James Stwart. And that's ok because Eastwwod is Eastwood despite all problematic statements of his personal life: he is a Hollywood star and doesn't need to try to be something he is not, especially for being fundamentally the anti James Stewart. To exercise his abilities as a movie maker to the maximum, the actor needs a solid script and the story of Leo Sharp had all pontencial for that. Here, however, the responsible for master pieces like Mystic River, Unforgiven and Million Dollar Baby lost himself. The Mule is probably one of worst Eastwood movies.